Many AAPIs struggle with mental health distress, but avoid going to see a counselor (https://bit.ly/2AiPCNg). 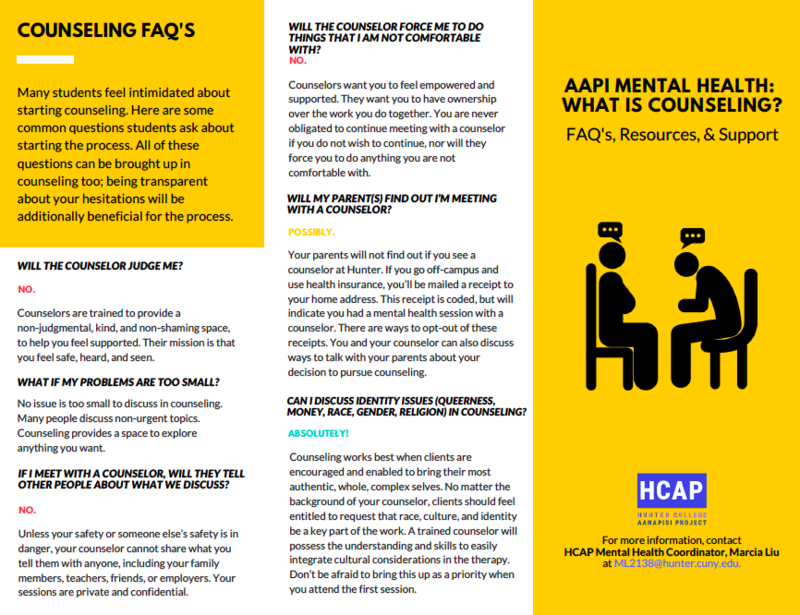 This brochure provides information for AAPI students who may be curious about what counseling is, how it can help, and how to find a counselor. Learn more about Hunter College’s Center for Counseling and Wellness (CWS) or download the HCAP What is Counseling? brochure. Does Hunter offer Counseling Services to Students? Hunter’s Counseling and Wellness Services (CWS) provides one-on-one psychotherapy for all students. Are there paper copies of this brochure? I’d like to share it with someone else. Hunter’s Counseling and Wellness Services (CWS) provides one-on-one psychotherapy for all students. You can visit their website (http://www.hunter.cuny.edu/cws/counselingservices/welcome) for information about the services they provide. Students typically meet with a counselor and are then referred to an outside provider in the community who the student can meet with for a longer term. Contact HCAP’s Mental Health Coordinator Marcia Liu (ML2138@hunter.cuny.edu) for a paper copy of the brochure.